Like many states, Florida has not specifically adopted an official state motto. Rather, In God We Trust has come to be accepted as the motto of Florida as an element of the Great Seal of the State of Florida. UPDATE: On June 22, 2006, Governor Jeb Bush signed House Bill no. 1145 adopting In God We Trust as the official state motto of Florida, effective July 1, 2006. 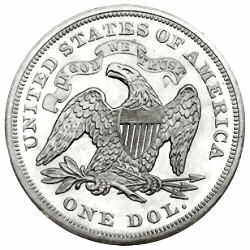 After the Civil War, Florida adopted a new State Constitution and, with it, instructions that, "The Legislature shall, at the first session, adopt a seal for the state, and such seal shall be the size of an American silver dollar, but said seal shall not again be changed after its adoption by the Legislature." "That a Seal of the size of the American silver dollar, having in the center thereof a view of the sun's rays over a high land in the distance, a cocoa tree, a steamboat on water, and an Indian female scattering flowers in the foreground, encircled by the words, 'Great Seal of the State of Florida: In God We Trust', be and the same is hereby adopted as the Great Seal of the State of Florida." Evidently, in addition to its size, Florida lawmakers also borrowed the silver dollar's legend for their seal. In this way, the motto In God We Trust was adopted as the motto of the State of Florida. The motto of the State of Florida may sound familiar. It's the same motto as the national motto of the United States picked by Secretary of the Treasury Salmon P. Chase in 1863 to appear on some coinage of the "Union" side during the Civil War. Evidently this was to indicate exactly which side had the upper hand in the conflict. In God We Trust came to replace E Pluribus Unum and was officially adopted as the national motto in 1956. The motto's intent is clear. It expresses a definite faith in a deity referred to as God. Like many state mottoes, the language defining the Florida motto is incorporated in a description of the state seal. The following information is excerpted from the Florida Statutes, Title 4, Chapter 15, Section 15.03. TITLE IV - EXECUTIVE BRANCH. 15.03 State seal. (1) The great seal of the state shall be of the size of the American silver dollar, having in the center thereof a view of the sun's rays over a highland in the distance, a sabal palmetto palm tree, a steamboat on water, and an Indian female scattering flowers in the foreground, encircled by the words "Great Seal of the State of Florida: In God We Trust." (2)(a) The Department of State shall be the custodian of the great seal of the state. (b) The great seal of this state shall also be the seal of the Department of State, and the department may certify under said seal, copies of any statute, law, resolution, record, paper, letter or document, by law placed in its custody, keeping and care, and such certified copy shall have the same force and effect in evidence, as the original would have. (3) Only the Department of State shall be authorized to affix the seal to any document for the purpose of attesting, certifying, or otherwise formalizing such document. Any facsimile or reproduction of the great seal shall be manufactured, used, displayed, or otherwise employed by anyone only upon the approval of the Department of State. The Department of State may grant a certificate of approval upon application to it by any person showing good cause for the use of the seal for a proper purpose. The Department of State may adopt reasonable rules for the manufacture or use of the great seal or any facsimile or reproduction thereof. Any person violating the provisions of this subsection is guilty of a misdemeanor of the second degree, punishable as provided in s. 775.082 or s. 775.083. History.--s. 4, ch. 1, 1845; RS 75; GS 76; RGS 90; CGL 112; s. 1, ch. 29841, 1955; s. 1, ch. 65-209; ss. 10, 35, ch. 69-106; (2)(a) formerly s. 21, Art. IV of the Constitution of 1885, as amended; converted to statutory law by s. 10, Art. XII of the Constitution as revised in 1968; s. 1, ch. 70-300; s. 11, ch. 71-136; s. 1, ch. 80-59.